a. Candidates should have Bachelor’s Degree in Management/Business Studies/Business Administration or equivalent degree with at least 55% marks/CGPA 3 from a recognized University. b. Candidates should be computer literate and must be fluent in written and spoken English and Nepali. c. Age: Not exceeding 30 years as on 31st Bhadra 2075.
d. Must be a Nepali Citizen. This position will be closed on the basis of written exam and interview. Only such candidates having transcript in hand , certifying the completion of the Bachelor’s degree shall be eligible to apply. a. Candidates should have full time Master’s Degree in Management/Business Studies/Business Administration/ Master’s Degree in Economics with at least 60% marks/CGPA 3.25 from a recognized University. This position will be closed on the basis of written exam and interview. Only such candidates having transcript in hand , certifying the completion of Master’s degree shall be eligible to apply. a. Candidates should have Masters’ Degree in Management/Business Studies/Business Administration/ Master’s Degree in Economics or equivalent degree from a recognized University. b. Minimum Three Years of Banking experience in Commercial bank. 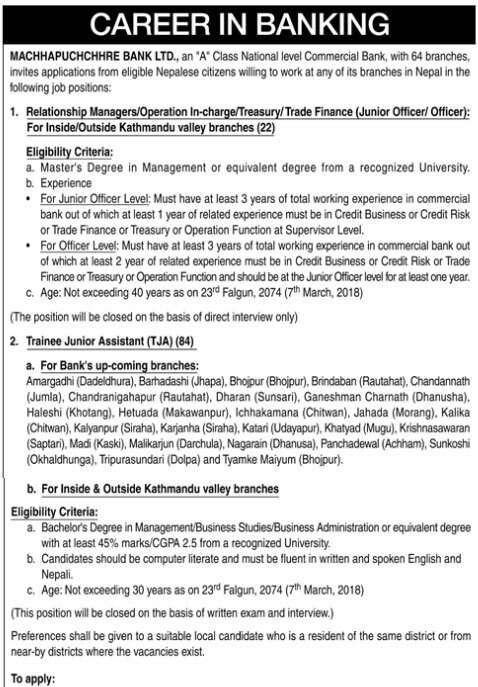 d. Age: Not exceeding 40 years as on 31st Bhadra 2075.
c. Must be at Supervisor Level for one year or at Senior Assistant Level for at least two years in Credit Department for Relationship Manager or Operation Function for Operation Incharge or Credit Risk Department for Credit Risk. c. Must be at Junior Officer Level for at least one year and should have experience as Branch Manager for minimum of one year. Interested applicants meeting the above criteria have to fill an 'Online Application Form', which can be accessed on the Careers link of the Bank's website: www.machbank.com. The online submission of resume closes at 5:30 p.m. on Bhadra 31, 2075 (September 16, 2018). Only resumes submitted online will be considered and only such applicants filling it online meeting the job criteria will stand eligible for further selection processes. The Bank reserves the right to reject any or all the application(s) without assigning any reason whatsoever.